After leaving Buckhannon in the early seventies for the new FBO in Morgantown, I keenly felt the attraction of the small grass airports whereI had cut my aeronautical teeth. The airport at Morgantown had many advantages for the flying business but I missed the camaraderie I'd enjoyed at the small airports. Then too, because Morgantown was located at the very northern border of the state, I missed the central area of West Virginia, where I grew up. Fortunately almost every airport has a sub culture of aviators who love the little, slow airplanes that were built so long ago and the adventures that flying such machines can bring. Morgantown was no exception. Flying, servicing and selling new airplanes was our job and it paid the bills, but for social aeronautics my tastes ran to yesterday's aviation scene. Our Cub was a perfect fit with the Aeronca's, Luscombe's and Cessna 140's that were pulled from Morgantown's hangars on pretty week ends, and we happily became a part of a group looking for summer taildragger adventures. Of course there were the twenty five dollar hamburger flights to airport restaurants in the area, and flights to see some attraction or the other, and the flights to area airshows, but the group fly in camping trips were my favorite. When summer high pressure systems came floating along and the forecast bespoke of a weekend with weather too perfect to not be in the sky, we would get our heads together and pick a small airport with a friendly FBO and acres of manicured grass to stake our airplanes to and pitch our tents on. Friday evenings would see us all airborne, our formation of bug smashers spread across the sky, highlighted by the golden, slanting light. One of our favorite camping destinations was Simpson Field, a 1300 foot grass field, where as a Private Pilot I had spent summers just hanging around, learning about aviation and where eventually I started my instructing career. 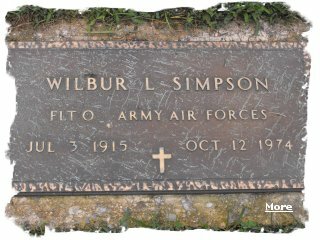 Simpson was located near the farm where I grew up and it was run by Wilbur Simpson, a WWII aviator who built the field after returning from the Army Air Corps. He had trained scores of area Vets on the GI Bill after the war, but by the seventies his training activity had declined and the short runway discouraged most pilots from trying to shoehorn their airplane into the strip, so he welcomed the activity that our armada of campers brought to his airport when we descended on him. Days at Wilbur's were spent taking short flights around the area, swimming in the pond below the runway, cleaning and waxing our airplanes and just relaxing in the quiet of this special place. Nights brought campfires, preparing and sharing meals and spinning flying stories in the best 'around the campfire' tradition. Sometimes there would be music, when a guitar was present. We would ordinarily strike camp, pack up and head back to the ordinary life of serious airplanes on Sunday afternoon, but on occasion, wanting to wring just a little more out of the weekend, we stayed over Sunday night and made an early departure on Monday morning. One such weekend, when the weather had been particularly beautiful and the campfire music and conversation most scintillating, we decided once again, to delay our return to the real world until Monday morning. At about seven that morning we checked the Morgantown weather and found it to be clear with 3 mile visibility in haze, much as it was at our location. As I recall, some of the other campers decided to wait for better visibility, so only the Cub, with me flying and Barbara in back with our 3 month old German Shepherd on her lap, Sam, with his Cessna 140 and Skip in the Chief took off for Morgantown. In this age of 150 knot airplanes being the norm, 3 miles is very minimal visibility and the edge of your vision forward is not much more than a minute away. While legal, it is a stressful and uncomfortable flight condition. But the 70 knots that our antique machines were traveling this morning (Sam and Skip had slowed to accommodate the Cub) enabled us to see almost three minutes ahead and while not ideal I felt it was a reasonable condition to be flying in. Soon though, the haze seemed to thicken and I saw the three miles visibility became two miles and then one. In what seemed like an instant and before we could turn and start back to Wilbur's airport, the mist below us closed up and became a solid undercast. And so there we were, three experienced IFR rated pilots in three very VFR airplanes, caught on top of clouds like the most careless student. We closed up our formation and with hand signals agreed that we should continue on north, in the direction of Morgantown in hope of clearing or at least a hole. Visibility aloft gradually improved to five miles or so, but the undercast remained stubbornly solid. Nearing Morgantown, Sam and Skip signaled that they were descending and started down. I was unclear about their intentions and as I watched I was horrified to see them descend into the undercast. I knew none of us were equipped for instrument flying and I wasn't about to join them in what I felt would be a deadly attempt to find the airport. We flew on north..
After about forty minutes of very tense progress, I saw a hill in the distance, poking up out of the clouds, like a green island in a sea of white. At that moment I felt the happiness that I suspect a shipwrecked sailor must feel upon spotting an atoll in the distance. Drawing closer I could see a ribbon of highway bisecting the hill, making what by this time looked like the most beautiful landing place in the world. At last we could put this airplane on the ground. The highway turned out to be Interstate 79 and a hurried landing was made followed by a hasty exit onto the median. Once installed there we watched traffic burst out of the fog at either end of our 'runway', the motorists giving us puzzled looks as they sped by; the spectacle of an old airplane, a young couple and a pup being very unusual inhabitants of the grass between the lanes. After the fog lifted we made our way to Morgantown, anxious to learn the fate of Skip and Sam. We were overjoyed to see them waiting for us on the ramp, alive and well, aircraft undamaged and anxious to tell us the story of how they found the airport and were able to descend through the clouds without losing control. As it turned out, Sam had a turn and bank instrument in the 140 and Skip had a radio. Using hand signals, they agreed that Skip would call Flight Service and get a DF steer (remember those?). 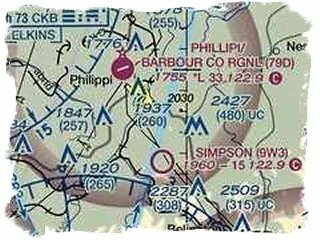 Their plan was that Skip would lead the way to the airport, following the directions from Flight Service, but Sam would maintain flight orientation with the turn and bank and Skip would maintain control by flying on Sam. As crazy as this 'bottom of the bag of tricks' plan was, it worked. As it happened Sam's father was working at flight service that day and it's doubtful if he ever gave a better DF steer in his long career. His smile was ear to ear when he saw the two airplanes emerge from the mist and touch down, and thus was one of the strangest instrument approaches ever done at Morgantown completed successfully. Both Sam and Skip went on to have a long and successful life's work in aviation and so far as I know, never repeated their Siamese Twin instrument approach again.